Audrey Hepburn and William Holden met on the set of Sabrina in 1954. If you’ve watched the film, you’ll notice the chemistry between the two is electric but it wasn’t just acting. The two had a passionate love affair off-screen. For many, this is old news but for Edward Z. Epstein he considered it enough of a juicy, heartbreaking tale to write more than 200 pages about it in Audrey and Bill: A romantic biography of Audrey Hepburn and William Holden. I am a huge fan of both Audrey Hepburn and William Holden. Individually, they are my favorite actress and actor and Sabrina is one of my favorite films. I was interested in this biography from the moment I heard it was announced but as someone who has read countless biographies on Audrey Hepburn and the one biography written about William Holden I wondered what will this author add to this story? Audrey and Bill were not Katharine Hepburn and Spencer Tracy. Their love affair started and basically ended when Sabrina wrapped up filming. Yes, they made another film together ten years later (the forgettable pile of trash known as Paris When it Sizzles), but Bill was involved with French actress Capucine during that production and Hepburn was married to Mel Ferrer. By then Bill was ravaged by alcoholism and it was in Audrey’s words the most unpleasant time of her life filming a movie. So really how did Edward Z. Epstein write 200 plus words about this? Well, the book is truly two biographies in one. You get to the love story some pages in but it doesn’t even take up the bulk of the book. There is nothing new in Audrey and Bill. The author recycles so many of the same stories that have previously been published and in some parts, it feels like I’m reading fan-fiction. It doesn’t appear that Mr. Epstein interviewed anyone who knew Audrey or Bill as there are very few attributed quotes. The book feels like Mr. Epstein just ripped accounts from fan magazines and stole research from others. I wanted to like this book so much but it’s a giant bore. Honestly, the love affair between Audrey and Bill isn’t really all that scandalous to begin with. Perhaps people want to make it into something salacious because Audrey represents an elegance that is synonymous with perfection. She is the anti-Marilyn Monroe with a subtle sensuality. The thought of her having an affair seems to go against that but that’s unfair to Audrey because she didn’t craft that persona, the media did. 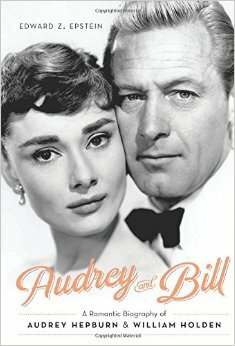 The book also leans more to Audrey’s life, we learn more about her life with Bill’s sprinkled in. Both are fascinating subjects with very different upbringings. I wasn’t surprised this is more Audrey heavy because she’s the more popular figure at the same time I was left disappointed because there’s not much devoted to Bill’s life as it is. I will give Mr. Epstein credit for writing with a great deal of respect for his subjects. Audrey doesn’t come off as a homewrecker and Bill doesn’t come off as a jerk, the two come off as two people who just fell in love. Their love story is an unfortunate and heartbreaking one. You walk away from this book feeling sympathy for both despite the circumstances. Still, I wouldn’t recommend this one. If you’re interested in learning about Audrey and Bill, I’d recommend individual biographies about the two because they shine light on the fascinating people these individuals were. I’d check out Enchantment: The Life of Audrey Hepburn by Donald Spoto and Golden Boy: The Untold Story of William Holden by Bob Thomas.